My name is Donna Carmel and I have been in the vintage jewelry business for a bit over 8 years. I collected and sold only Miriam Haskell for the first year and a half and then realized that vintage jewelry was my bliss and decided to branch out. I just love the vintage experience and want to share it with all who want to take the journey with me. I have found my bliss in vintage jewelry and am now spreading out to include the entire vintage experience. I own YesterdayOnceAgain on Etsy. 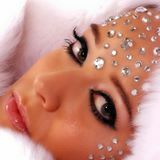 I also have a free-standing website GlitzyandChic.com. This site is dedicated to the memory of my father, Warren (Petie) Goldman who passed away on October 5, 2012. I promised him that I would open this shop and have kept my word. Daddy, rest in peace. I am Donna Carmel. Because of my father's faith in my creativity and imagination I have opened this shop and designed over the top runway statement pieces. Some of them are one of a kind. True glitz. Sure to get your diva on. All of my love goes into each piece I create. As I create one design another design pops into my head. I hope you enjoy these unusual pieces. Don't forget to Get Your Diva On. Last Updated: Oct 21, 2018 Listing Expires: Mon Oct 21 12:25:52 2019 This listing has been viewed 4376 times.